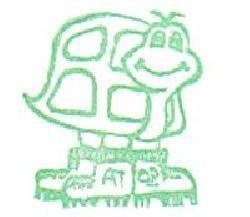 The Tortuga Boots signature stamp was born on a wet, dreary day in August 2003 in the state of Connecticut. The frogs were out thick, and Amanda of Seattle fame carved it in honor of the Green Turtle's Appalachian Trail thru-hike. The left boot clearly says AT, but Amanda never did like the right boot that says 03. Ryan retired his old bootless signature stamp and has been stamping in with Tortuga Boots ever since including an estimated 60 or so trail registers, 800 letterboxes, and 400 exchanges. Not to mention the 500 or so stampings of invoices, envelopes, and other miscellaneous items. In four different countries. In March 2006, the stamp traveled to Dartmoor and the famed Cranmere Pool letterbox. It has exchanged with such luminaries as wassamatta_u, Celtic Quinn, Trekkie Gal, Wisconsin Hiker and Martini Man, Doublesaj n Old Blue, Alaska Homeschoolmommy, Dixie, Eidolon, and--most recently--Webfoot. Tortuga Boots is survived by his older brother, Tortuga Barefoot; his caretaker, Green Tortuga; his mother, Amanda from Seattle; and far too many friends from around the world to mention by name. Memorial services may be held in Gorham, Maine, the last known location of Tortuga Boots. In place of flowers, it was Tortuga Boots's wish that donations be made towards premium memberships on Atlas Quest. My heart lies heavy within my breast, knowing that The Booted One has left us for a world beyond, for parts unknown, for a realm far removed from this life we love. He shall be missed, he shall be mourned, and he shall always be remembered. But let your tortured soul take solace amid the pain, in the simple knowledge that RYAN CALLED ME A LUMINARY! Woohoo!!!! I am so sad to hear that Tortuga Boots was not located by the Fright Night Detective Squad! The reward offered was a huge incentive! I still have hopes that the goblins will release him from their grasp, or that it will be discovered that he simply crawled under a leaf to escape the rain that night and will surface to take to the trail again! And to think - I have one of the last known exchanges with the Green Tortuga in Boots - a priceless treasure in my logbook, not to mention being listed in such august company (and how could I be a luminary when I didn't pack my flashlight??)! Yipes! I wonder if he might show up on Ebay..ala K-martha? My condolences if he is lost forever...but I will say a novena that some kind soul finds him and returns him to his loved ones.. If in fact he has left your side for good(which is BAD! ), at least he passed away with a that wonderful grin! He must've had a happy heart too and we are honored to have his image in our log book as a permanent momento. The Tortuga Muerte box in San Francisco will now have a much deeping meaning! Although currently on a hiatus, this box will be revived soon. I will include a special memorial to Tortuga Boots in the logbook. Wasn't there also another rbother who pre0deceased him, Tortuga Umbrella? Tortuga Umbrella, yes, has been confiscated by the NPS. But he was never a signature stamp and was never part of the family like Tortuga Boots or Tortuga Barefoot was. Rest in peace, Tortuga Umbrella. I'm exhausted, and I haven't even started yet!